Happy Birthday Norma ! June 1st was Marilyn Monroe’s birthday and she would have been 91. I took the chance to dress up in my favorite Marilyn Monroe hoodie, watch “The Misfits”, and sip dom perignon champagne. If you missed the date its not too late to celebrate(its still her birthday week), or get ready to celebrate the next June 1st. These events are in chronological order to show the ideal way to celebrate Marilyn Monroe birthday. Depending on how much time you have you may only be able to do one or two a day. This outfit can be a great conversation starter. 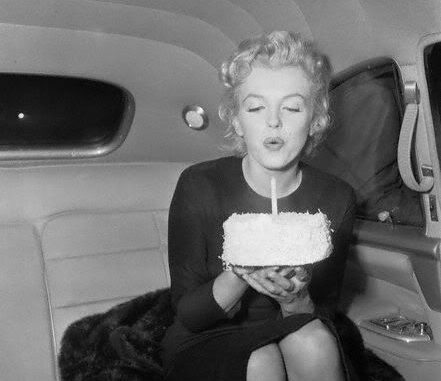 Most people I talked with don’t even realize it is Marilyn Monroe’s birthday until they talk to you! If you are hesitant to douse yourself in Marilyn Monroe graphics you can go for a more subtle look and wear a 50s sweater or a Marilyn Monroe style dress. Any big fan will recognize your tribute if it is June 1st. Now that you are dressed for the occasion you are ready to hit the town. 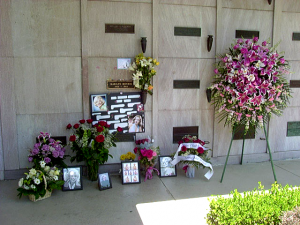 If you are in LA you have the chance to visit Marilyn’s grave at the westwood village memorial park cemetery. On June 1st the grave gets a constant stream of admirers from around the world who are leaving flowers, photos, and even kisses. Friends of Marilyn’s mother, Grace Goddard and Ana Lower, are also buried here. They helped raise Norma as a small child and are some of her closer family. When Joe Dimaggio was left responsible for Marilyn’s arrangements he chose this cemetery so they could be close together. If you’re still in LA slip on your CA or bandana Marilyn Monroe hoodie and head to the walk of fame. On February 8th 1960 a star was added for Marilyn on the walk of fame. The star is located on the 6700 block of Hollywood Blvd. Unfortunately the area has changed a lot in the last 50 years and it is now across from a McDonalds. It is one of the dirtier areas with lots of trash, spilled food, and panhandlers. 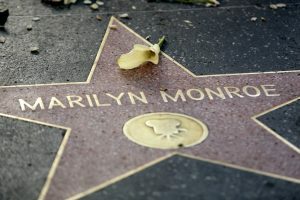 There is a petition in progress to move the star from this location to the front Grauman’s Chinese Theater which was one of Marilyn’s favorite places. Considering how famous and important she was for Hollywood it makes sense to move her to the shiniest area. If LA is not quite your city you can opt for an urban or artsy Marilyn Monroe sweater and tour the big apple. The bench near her home where Marilyn would often sit. You can find Marilyn’s New York stomping ground around E 57th St and Sutton Place, near the East River. Her first address was 2 Sutton place, then in the late 50s she moved into 444 E 57th St on the 13th floor with her husband Arthur Miller. She liked to go for walks in the neighborhood and local parks. You can follow her footsteps by walking to a small park at E 58th street. 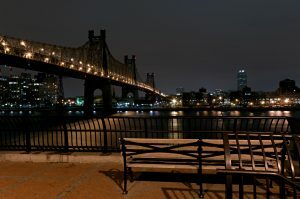 There’s a bench here overlooking Queensboro bridge where she would relax and spend time reading or just being alone. A one mile walk from her Sutton Place will get you to 590 lexington avenue near 52nd street where the famous dressing blowing scenes were filmed. You can even stand on this grate yourself and imagine what it felt like to have 5,000 bystanders snapping pictures while being hit by gushes of subway air. Stop for a bite to eat at the Subway Inn (143 E 60th St). 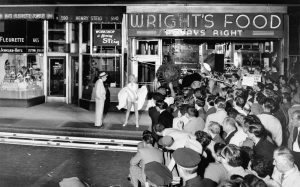 Marilyn ate here for dinner a few times during the shooting for The Seven Year Itch movie. Marilyn Monroe drinking Dom Perignon champagne with Lawrence Schiller during a photo shoot. A birthday is the perfect occasion to celebrate with a drink. Marilyn’s favorite was Dom Perignon champagne, which she kept her home stocked with and loved to pair with most of her meals. On 1962 she made an emergency run for two bottles of it with Lawrence Schiller. After drinking together they made one of her last and most memorable photo shoots. For dinner she usually paired the Dox Perignon with meat like steak, lamb, or liver; and a side of carrots. As you end the day snuggle up in your sweatshirt or blanket and spend some time with Marilyn by watching some of her films, documentaries, or reading biographies and autobiographies. The Misfits – The role Norma always wanted to play, and more true to her personality. Unless you have access to a high-speed jet it might be tough to do all the above in one day. The idea is just to spend the day thinking about Marilyn Monroe and celebrate her life. Even if that means just wearing one hoodie or sweatshirt and watching your favorite Monroe movie.